I love baking cookies, and Kurt loves finding freshly baked cookies in the kitchen. So, it was a happy day when I received a review copy of the new Dorie's Cookies book. In the introduction, Dorie mentions that she’s wanted to write a cookie book since she started working on cookbooks 25 years ago. Of course, her other books have included some cookie recipes, but this is the first devoted to nothing but cookies. The options cover the full spectrum from classics to bars to sandwich cookies, and there are even some savory options to serve with cocktails. One chapter is just for the cookies baked and sold from Beurre and Sel which was a cookie boutique she operated with her son. And, the final chapter is for Cookie Go-Alongs and Basics, and it includes ice cream to serve with cookies, ganaches and spreads to fill sandwich cookies, glazes to top cookies, and more. I started baking as quickly as I could after opening the book. There are a few recipes that call for kasha and specifically Wolff’s medium granulation kasha. I’ve cooked buckwheat groats and baked with buckwheat flour, but I was not familiar with medium granulation kasha. As promised, it is easy to find, and it adds a bit of crunch to a cookie. With buckwheat flour, the medium granulation kasha, and flaked sea salt on top, Kerrin’s Multigrain Chocolate Chip Cookies had a nutty, more complex flavor than your standard chocolate chip. And, they were Kurt-approved. I also tried the Espresso Chocolate Sables. That’s a recipe from the Beurre and Sel collection, and almost all of those cookies are intended to be baked in rings. All of these recipe suggest rolling the dough, chilling it on sheets, cutting the dough into two-inch rounds, and either baking the cookies in metal rounds if you have them or baking them in muffin tins. I went a different route and used the dough for a slice and bake technique. After forming a log of dough, I chilled it, and then cut rounds that I baked on cookie sheets. They spread just a bit, but they were still delicious with espresso flavor running through the crumbly, buttery cookies. The third cookie recipe I tried was the Cabin-Fever Caramel Banana Bars as it’s called in the book. Dorie came up with the idea while going stir-crazy during a blizzard. But, they’re great treats for any weather. I had one little problem with this recipe, and I’ll explain how I got around it. You begin by making a quick caramel by melting butter in a saucepan with brown sugar. That mixture was transferred to the bowl of mixer and allowed to cool for about 10 minutes. Flour, salt, baking powder, baking soda, and cardamom were combined. In a separate bowl, a ripe banana was mashed with yogurt. Next, granulated sugar was added to the bowl of the mixer and mixed followed by the addition of an egg and vanilla. The banana-yogurt mixture was added, and then the dry ingredients were stirred into the batter. Chopped salted peanuts were folded in before pouring the batter into a buttered and floured eight-inch square pan. The pan went into the oven for twenty-two minutes or so. For a chocolate topping, finely chopped chocolate was to be sprinkled over the baked bars as soon as the pan came out of the oven. Then, the pan was to go back into the warm but turned-off oven for a few minutes to melt. I must not have chopped the chocolate finely enough because mine didn’t melt well enough to spread even after several minutes. The chocolate seemed to seize up and not want to move. I ended up scraping off the unmelted chocolate and starting over. I melted chocolate by itself in a bowl in the microwave and then poured it over the bars. More chopped salted peanuts were sprinkled on top, and the bars were left to cool until the chocolate set. Despite the small issue with the chocolate topping, I still really liked these bars. 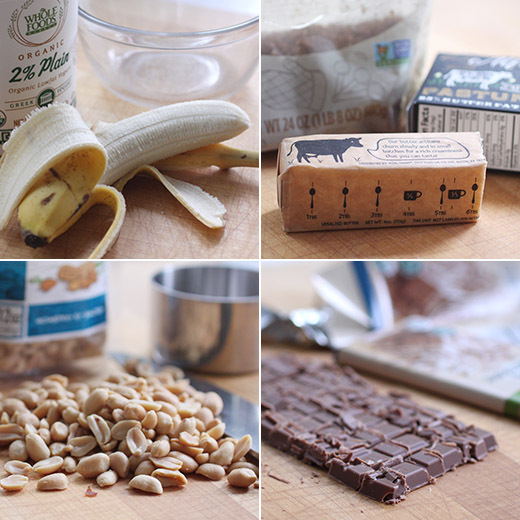 Banana, peanuts, and chocolate make a great combination. Now, I have a decision to make. What should I try next, the Snowy-Topped Brownie Drops or the White Chocolate Poppy Seed cookies? You are so right about the combo of peanut, chocolate and caramel...these cookies must be delicious and addictive. A must try cookie! I just picked up a copy of Dorie's Cookies and can't wait to start baking cookies. I agree, which recipe? So many scrumptious choices. A tempting treat! Lovely flavours. I got her book too, and made her brownies, very very nice. I have a ton of recipes bookmarked to try, and your choice to highlight her book is one of them! 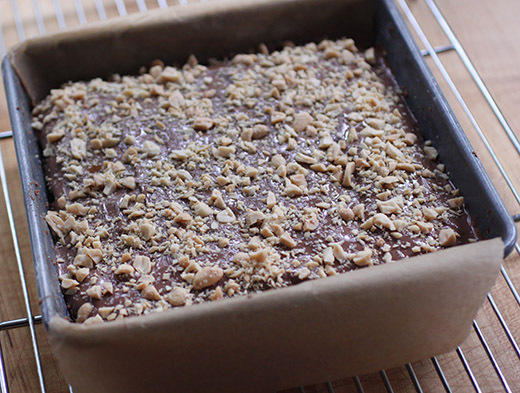 I have never had the combination of peanut, banana and chocolate...and it sure sounds and looks great...thanks for the recipe Lisa! Hi Lisa, oh I've heard so much about this book, sounds amazing. Love the caramel banana bars, they look delicious. What a dilemma, the Snowy Topped Brownie Drops or the White Chocolate Poppy Seed cookies? Both sound amazing. Chocolate y banana una perfecta combinación me encanta,se ve goloso,abrazos. I love baking with buckwheat flour, but never have tried kasha. Interesting review, Lisa. 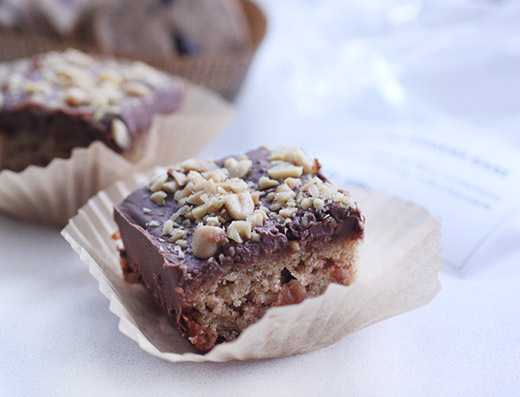 The banana chocolate bars/cookies look good. I have a bar recipe that you dump chocolate on the warm top to melt. I use thin old fashioned Hersey bars and it works. What ever works, we adapt. Right? I've been longing to try this cookbook - thanks for the review! These bars sound great and I'd love to make them next.